Get ready to wax nostalgic with these retro Halloween candies, which deserve to make a comeback on trick-or-treat night. Some of these are harder to find in stores these days, but they're all still available online. 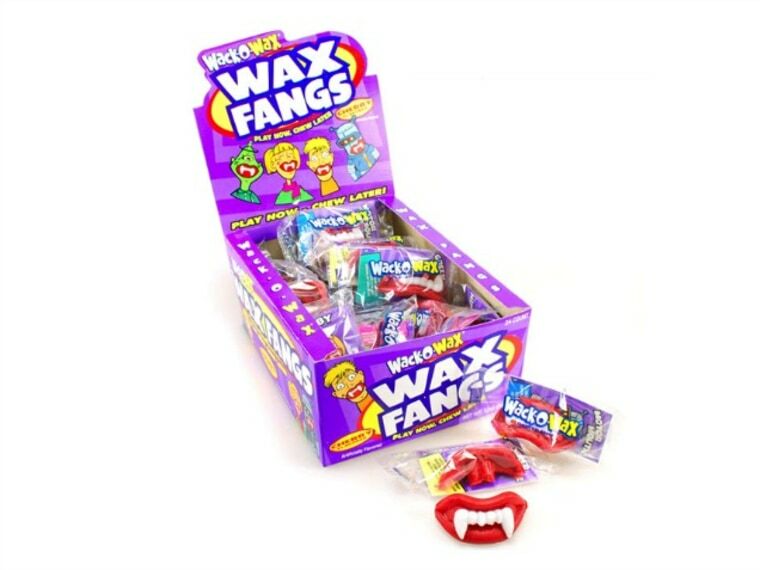 Officially titled Wack-O-Wax, these plump wax lips with sinister fangs are a Halloween classic. Those who have sported these treats know that they skirt the line between candy and prop, with a tasty cherry flavor that turns wax-like pretty quickly. But still, who can resist an edible costume? With its vintage taxi-checkered wrapper, the Abba Zaba, launched in 1950, looks like a candy bar from another era—and it tastes that way too. Once you unwrap it, you'll find a shiny layer of white taffy coating a salty-sweet peanut butter center. These wax bottles filled with brightly colored sugar syrup get their name from their original price (a nickel) and the preferred method of popping the top off the waxy bottle: a nip. Although it's getting increasingly difficult to find, the Sky Bar is one of the most thrilling candy bars around. The milk chocolate bar is divided into four sections, each housing a separate filling: fudge, caramel, vanilla nougat and peanut. This Depression-era candy bar, made in Texas, is actually a tube of peanut butter dipped in a hard candy shell that's rolled in toasted coconut. The individually-wrapped candies are shatteringly crunchy, but let them sit around for a while and they'll soften up. Satellite Wafers are surely a byproduct of the UFO craze of the 1950s, but somehow these saucer-shaped sweets have stuck around longer than the collective fascination with aliens. Each Satellite is made of two pastel-colored wafers that are sandwiched together and contain tiny beads of sour sugar. The texture is pretty out there—sort of like eating Styrofoam peanuts. Weird? Sure, but fun in an outer-space kind of way. Remember Fruit Stripe, that yellow, green, red and orange gum endorsed by a multicolored zebra with a penchant for extreme sports? Well, it's still around as, are the super-cool temporary tattoos that come with each package. Sweet little Sugar Babies are jellybean-shaped nubs of milk caramel. Inspired by the Broadway hit song, "Let Me Be Your Sugar Baby," the original formula included a tiny amount of bacon extract to up the savory factor. Underneath the ZERO bar's minimalist white coating are dark, chewy layers of caramel, peanut and almond nougat. This 1920s-era candy bar definitely deserves a revisit. Still made by the Boyer company in Altoona, Pennsylvania, these milk chocolate cups are studded with bits of coconut and filled with a whipped marshmallow-cream center. As a sign that they're evolving with the times, Mallos are now available in dark chocolate too.